When Charles M. Gage opened a oyster house on Brooklyn's Fulton Street in 1879, the Brooklyn Bridge wasn't finished, the Statue of Liberty was just an idea, and the subway was still 25 years away. One account says that before going off on his own, young Charley Gage used to run an oyster stand with his father on Navy Street—makes sense, as it was right in the middle of New York's 19th century oyster boom. 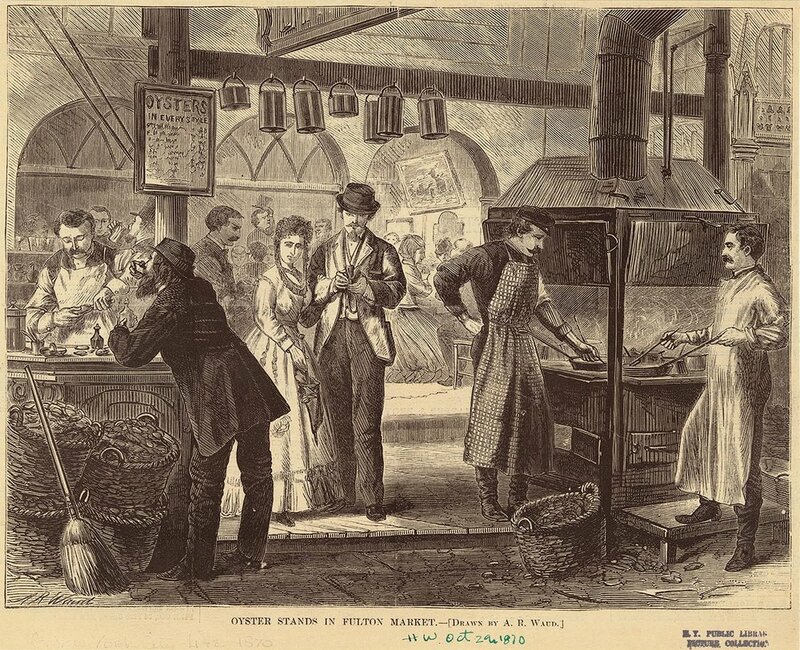 "Oyster stands in Fulton Market," from Harper's Weekly, October 29, 1870, found on VisualizingNYC.org. Eugene Tollner joined him in the venture shortly thereafter, and they moved the business to 372 Fulton near the corner of Jay, just a block or two away from the courthouses and government offices that employed many of their loyal customers. When they made the move, Gage was 41 and Tollner was 40. For more close to 40 years, the pair worked together, and "never had a dispute," according to the New York Times; Mr. Tollner named his son after Mr. Gage. After they sold the business in 1911 to Messers. Cunningham and Ingalls, the two founders tried to retire, but it didn't take. They "were like two lost sheep after they sold out. They used to drop in and sit there for hours." When Mr. Ingalls dropped dead in the Gage & Tollner dining room just a few weeks after the purchase, the founders stepped back in to give Mr. Cunningham a hand. Eugene Tollner worked there for another 24 years, until his death, on his way to work the day before his 86th birthday. He had worked at Gage & Tollner for a total of 56 years.